Rumors of Erik Killmonger's demise may have been greatly exaggerated. Black Panther 2, to the surprise of nobody, is in the works at Marvel Studios, even if they have yet to formally announce it. But given the first movie's success, this has been all but guaranteed for nearly a year at this point. While it hasn't been revealed who precisely will be returning for the follow-up, one surprising name has come up in the form of Michael B. Jordan. During the red carpet event ahead of the SAG awards, Angela Bassett, who plays Ramonda in Black Panther, was interviewed alongside her husband, Courtney B. Vance. During the interview, Bassett was asked if everybody, with no specifications put on it, would return for the sequel, to which the actress replied, "I would assume so." Then Vance stepped in to offer the following. "Yes, just go ahead and say it, yes! Everyone will be there... including Michael B." As those who have seen Black Panther will surely recall, Killmonger, played by Michael B. Jordan, met his demise at the hands of Chadwick Boseman's T'Challa. Instead of accepting what healing power Wakanda had to offer, Killmonger opted to instead die in solidarity with his ancestors in one of the movie's most poignant moment. But we didn't actually see him fall into the ocean. Is he really dead? 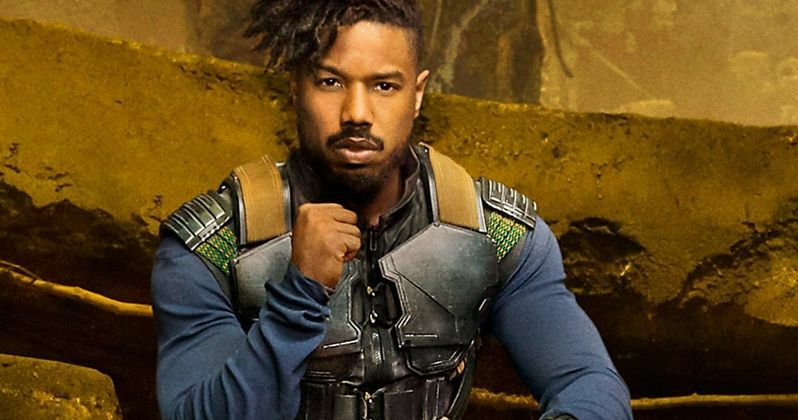 Could Killmonger really be coming back? Will Avengers: Endgame factor in somehow? This isn't the first we've heard of it being a possibility, but it certainly adds fuel to the fire. Unlikely returns are nothing new within the framework of the Marvel Cinematic Universe. There have been plenty of fake-out deaths in the past, from Nick Fury in Captain America: The Winter Soldier to Loki on a couple of occasions. Within the realm of comic book movies, it's not unthinkable that Killmonger could come back. But director Ryan Coogler, who has officially signed on to return for the sequel, certainly wouldn't cheapen what was accomplished previously. As Angela Bassett pointed out in the same interview, these movies rarely get the type of recognition that Black Panther has garnered. "A movie of this style, it has a hard time. It's accepted by the audiences, of course it's a global sensation, all of that, but the award [shows] tend to push them to the side. But it's such a well-crafted, well-made, beautiful story, big moments, big themes, and I think it's so utterly worthy." Not only did the movie gross more than $1.3 billion globally, but it went on to win the SAG ensemble award for Outstanding Cast Performance and was recently nominated for seven Oscars, including Best Picture, becoming the first comic book movie ever to do so. So, if it narratively makes sense, Killmonger could very well be back in the sequel. But just don't expect Marvel to pull some lame gimmick in order to get a big star back. Black Panther 2 does not yet have a release date. This news was first reported by Entertainment Tonight.